Have you ever wished that just for a day you could be transported to a bygone era in an exotic location? Seven members of the California Side by Side Society came to Rock Springs Ranch for a weekend to re-create the romance of past times and faraway places. 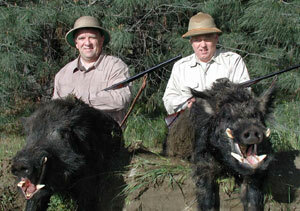 Steve Helsley of Sacramento and Bill Dawson of Palo Alto brought in these two trophy boar using vintage firearms. Steve's is a Holland & Holland .500, 3 1/4" BPE Hammer Gun, c. 1889, Bill's is a Holland & Holland .375, 2 1/2" Nitro Double Rifle, made in 1897. 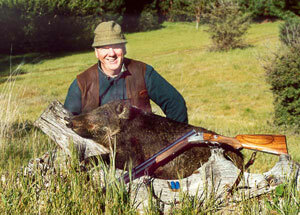 Roger Sanger from Monterey hunted chukar, pheasant, and boar with his Sempert Krieghoff Drilling  16 x 16 x 8mm x 57mm JR, c. 1930. 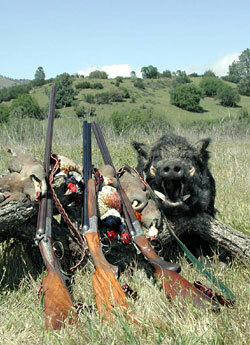 Armed with a wide array of drillings, double rifles, percussion guns, single shots, and cape guns, the group successfully hunted wild boar, chukar, and pheasant.